“Been a Slice” beer has been created to raise awareness and funds for the food rescue organization. TORONTO, ON, CANADA, October 29, 2018 /EINPresswire.com/ -- Toronto-based creative agency Bob’s Your Uncle has partnered with Second Harvest, the largest food rescue charitable organization in Canada, to create a limited-edition beer made from bread. 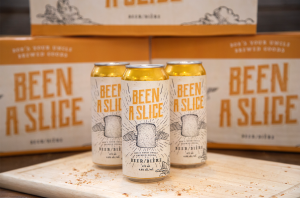 The resulting beer, called “Been a Slice,” is a new and unexpected way to raise awareness for the charitable organization. Canadians are among the world’s biggest wasters of food, with the average Canadian sending more than 396 kilograms of food to landfills each year. There, it decomposes and produces methane, a greenhouse gas 25 times more powerful than carbon dioxide and a key contributor to global warming. Been a Slice was brought to life with pro bono assistance from a number of Toronto-based partners. Bob’s Your Uncle developed the concept, while independent brewer Common Good Beer Co. is brewing the beer, Prairie Boy Bakery is supplying the bread, My Brother Darryl developed beenaslice.com and Outfront Media provided extensive outdoor billboard space in Toronto. Bob’s Your Uncle is a Toronto creative agency dedicated to thoughtful food & beverage brands. The agency has supported Second Harvest Food Rescue for ten years and also serves Olivieri Pasta, Carmen Wines, Yorkshire Valley Farms, Popeyes Louisiana Kitchen and Cineplex VIP. About Common Good Beer Co.